Now that the first day of spring is here, hopefully warmer weather will stick around and you can spend more time outside. At Hortons Home Lighting in La Grange, Chicago, and Orland Park, we love helping people find the perfect outdoor lighting, especially as they work on improving their front and back yards. If you’ve been thinking about upgrading your exterior lighting this spring, then here a few simple things you can do that can have a big impact. If you’re replacing your front sidewalk or you put down pavers to lead the way to your front door, then it’s important that you and your guests are able to see after the sun goes down. 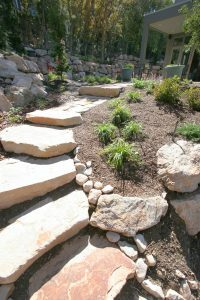 Installing pathway lights along the walk will provide ground-level illumination that makes it easier for people to see the transitions between pavers, or the first step leading up to the porch. Pathway and garden lights can also accentuate your lawn and landscaping, and can create the perfect ambient glow in your front yard. Many homeowners have opted for a pergola in the backyard, in favor of a covered porch or deck. The openness of a pergola allows for better airflow, but it also blocks the harsh rays of the sun on those warm summer afternoons. The one thing that a pergola doesn’t always offer, however, is adequate lighting. You may have built your pergola a few years ago, and since then, you’ve wanted to add more lighting to it. There’s likely an outdoor socket near the pergola, and running a few sections of string lights can brighten your backyard and create the ideal atmosphere for get-togethers on those pleasant spring evenings. If you want moveable light that can go where you go, then think about investing in some outdoor lanterns. You may have an outdoor hook where you can hang one, while the other can go on the deck railing. At Hortons, we have permanent post-head and pier lanterns that will look great in your backyard, but if you want to be able to place them in the perfect spots, then moveable options are the way to go. You can find LED options that last for several seasons, and you’ll love how easy it is to brighten your yard with just a few lanterns. Do you have that perfect tree in your backyard – the one that has low, straight branches that provide amazing shade during the spring and summer? If you do, then why not consider hanging a light fixture from one of the branches? There are many outdoor orb lights and pendant fixtures that will look great hanging from your tree, and you can create the perfect seating area underneath it. At Hortons, we’re always excited for spring and the house ideas that it brings with it. If you’re focused on upgrading the outside of your home this year, then visit one of our showrooms today to find the perfect outdoor lighting options.